The Pine Hill Apartments complex on Strawberry Hill Avenue in Stamford, Conn., has sold for $25.5 million. Pine Hill Apartments on the outskirts of downtown Stamford has sold for $25.5 million in one of the city’s largest residential sales of the past year. 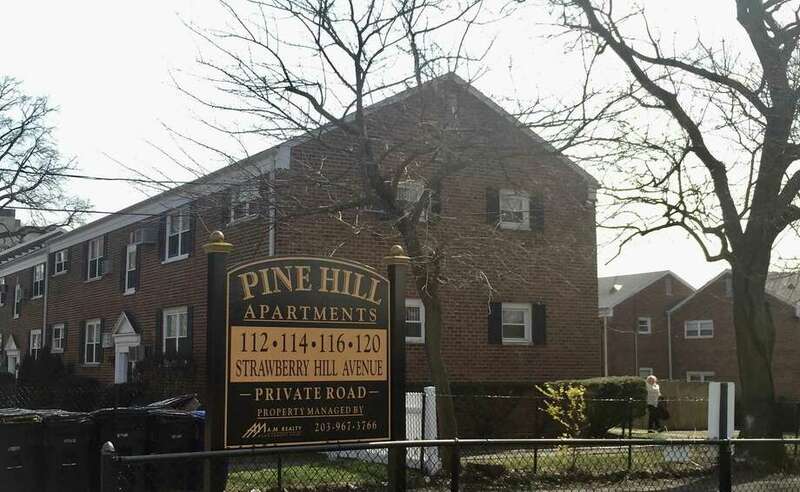 Stamford-based Pine Hill Apartments LLC sold the complex, at 112-120 Strawberry Hill Ave., to Tuckahoe, N.Y.-based 125th Strawberry Hill LLC, according to city property transfer records. The sale price compared with a total appraised value of about $14 million for an approximately 140-bedroom campus, according to the online property database Vision Appraisal. Pine Hill Apartments LLC’s business address, at 76 Progress Drive, is the same as that of the apartments’ manager, A.M. Realty Management Corp. A.M. Realty officials were not immediately available to comment. Officials at 125th Strawberry Hill LLC could not be reached for comment. Some Realtors said the sale should not be seen as a definitive indicator of the condition of the city’s residential sector. Several other apartment buildings in the city have sold for eight figures in the past two years. Last December, a downtown apartment complex at 1450 Washington Blvd., the 261-unit The Wescott, sold for $67 million. In January 2017, the approximately 200-unit 66 Summer Street building sold for $67.5 million, while the 125-unit Parallel 41 complex, at 1340 Washington Blvd., went for $33.35 million. In December 2016, in the city’s largest real estate sale of the past decade, five apartment buildings in the Harbor Point complex in the South End were sold by Stamford developer Building and Land Technology for a total of nearly $400 million to Manhattan-based Gaia Real Estate. While major residential properties continue to attract buyers, the city is maintaining a brisk construction pace. The 325-unit Atlantic Station, at the corner of Atlantic Street and Tresser Boulevard, and the 209-unit Vela on the Park, at the intersection of West Park Place and Washington Boulevard, represent the two most recent additions to the city center’s housing stock. Late last year, BLT opened its NV building, comprising 392 apartments in a 15-floor building, at the Harbor Point complex in the city’s South End. A couple of blocks away, on a site between Harbor Point Road, Pacific Street and Dyke Lane, BLT is constructing two towers that would hold 435 units. Those buildings are scheduled to be completed in 2019. In the Waterside section, 218 units under construction at BLT’s Harbor Landing complex on Southfield Avenue are scheduled to open later this year.